When you have a microfabrication company, the equipment and materials that you can dedicate to customer projects is important, but it is the depth of your engineering talent that is critical. That puts recruitment at the top of our priority list, and it is why Rogue Valley Microdevices has participated in MECOP, an engineering-specific internship program founded on close industry-university collaboration. 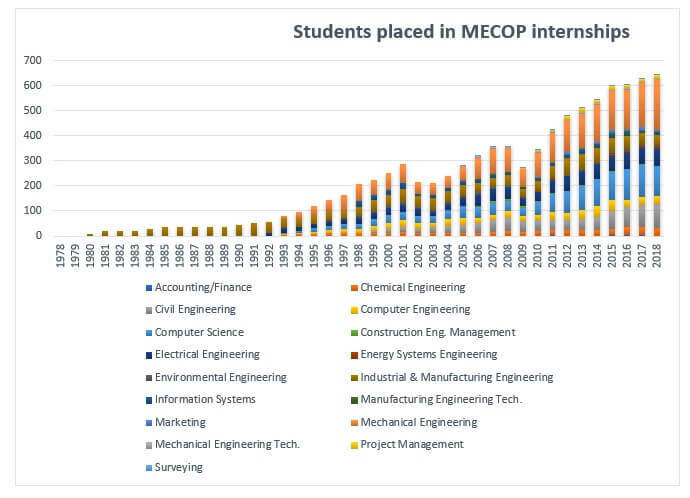 MECOP (Multiple Engineering Cooperative Program) was founded in 1978 by major Oregon companies such as Tektronix and The Boeing Company in conjunction with Oregon State University’s Department of Industrial Engineering. Two years after its conception, MECOP accepted seven students into the program. The growth since that time has been phenomenal, with more than 650 engineering students placed in internships in 2018. In addition to OSU College of Engineering, MECOP now places students from Portland State University, Oregon Institute of Technology and the University of Portland with technology companies. According to a recent US Congressional Research Service Report, “The U.S. Science and Engineering Workforce: Recent, Current, and Projected Employment, Wages and Unemployment,” there were only 31,990 chemical engineers employed in 2016. Compare that to 183,770 electrical engineers and 285,790 mechanical engineers employed during the same year, and you can see why Rogue Valley Microdevices – which relies heavily on chemical engineers – needs to get creative when recruiting. Fortunately, MECOP provided an internship program that could not have been better matched to our needs. What makes a MECOP intern? For the past seven years, we have welcomed MECOP interns to our company. Today we have three former MECOP interns on our engineering team, including Engineering Manager Katherine Tadehara. While Katherine did not intern at Rogue Valley Microdevices, she did hire two other MECOP graduates for our engineering group. Like Katherine, they are highly capable, well-educated chemical engineers who help to define our company. While the quest for good engineering talent will always be a challenge for employers, by partnering with MECOP, we will continue to have access to the best possible water in a well that will never run dry.